Bigger is not better. Fancier is not better. Cheaper is not better. Better is better. If that interests you, then you are ready to experience the Violet Gro Difference. But what makes all of that possible? It's All About the Lens! Others may claim to use the best LEDs on the market. So do we. Others may use the best drivers. So do we. But what others can't do is give you the Violet Gro lens. It's combination of extraordinary optical properties and physical properties, produces a lens that will give your plants the light they need while giving you the savings you want. Learn more about the Violet Gro Lens. Think All LED Lighting Is the Same. Think Again. The Violet Gro LED lights produce a broad spectrum of light ranging from UV to Far Red. The spectrum closely matches the blue and red output from the sun, while minimizing any unnecessary heat from green and yellow frequencies, to produce the optimal plant growth and vibrancy without extra costs. Just as different plants have different nutritional and watering requirements, they also have different lighting requirements - depending on the time of the grow cycle, species of plant, or type of set up in your facility. Violet Gro spectrum can be adjusted, at customer request, to incorporate more of the light that your plants want and need. With its unique design, Violet Gro lights can be customized with your desired proportion of red, blue, white, and even UV LEDs. Check out plants grown with the Violet Gro difference in our gallery. Violet Gro's light bars use state-of-the-art LEDs that are extremely efficient. With low wattage per fixture of 200W for an 8' bar, Violet Gro can translate to significant energy costs savings even compared to other LED options. The low wattage per fixture can add up to over 70% cost savings per fixture versus other lighting options. Find out what savings Violet Gro lighting could potentially mean for you. Would You Dare Touch Your Current Light? With Violet Gro - You Can! LED lights naturally run cooler than traditional lighting, with Violet Gro lights running cooler than even the market leading LED products. HPS lighting, on the other hand, runs very hot and can create additional energy requirements due to these extremely high temperatures. HPS bulbs can reach 750 degrees on the surface, raising room temperatures 15-30 degrees. Violet Gro's patented technology enables the LEDs to be in direct and immediate contact with our specialized lens material. This cutting-edge design provides your plants with more photonics output at a lower energy usage than other lighting solutions because more light is able to make it through the lens and ultimately reach the plant. When a photon is produced, it either remains as light energy until absorbed by the plant, or it converts to heat. When lights, whether HPS, T5 or LED produce light in areas of the spectrum that the plant will not fully absorb, those photons ultimately are converted to heat. 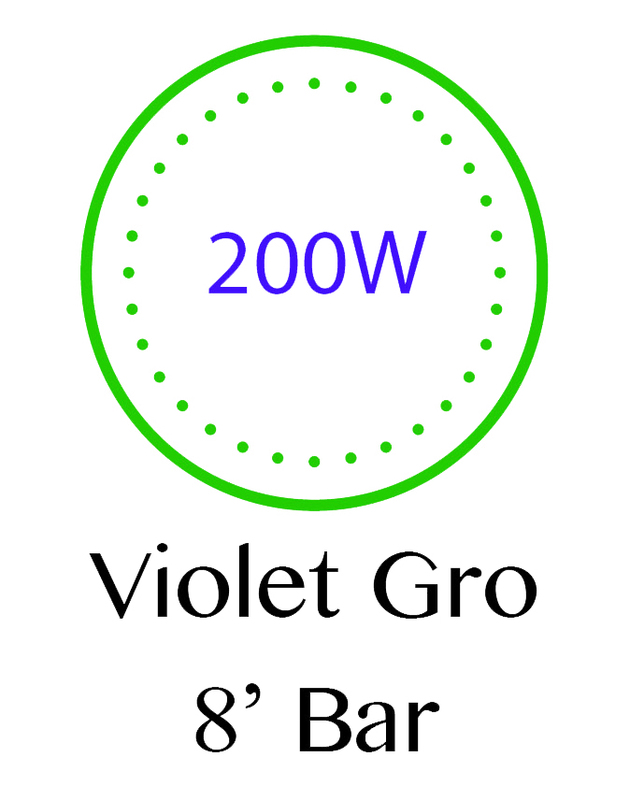 While Violet Gro can provide a broad spectrum (280nm-800+nm), the intensity is targeted at what plants need and want the most for healthy growth, minimizing the amount of energy wasted. When it comes to setting up your facility, it's not just the electricity costs, it's whether or not your facility can actually handle the electrical load associated with running your lights. How about not having to add more electrical breakers? With less than 2 amps per 8 foot bar, you can easily put eight 8' bars on a 20A breaker versus just 2 HPS lights. Each of the above options could run off of a single 20A breaker. Ultraviolet light has been proven to generate additional benefits for plants, including enhanced production of flavonoids and cannabinoids. UV is also advantageous in helping to control mold, powdery mildew, and other plant pests such as mites. While other products may indicate that they incorporate UV light, they might not advertise the degradation and even destruction that occurs over time from UV or deep blue light. Therefore, Violet Gro can effectively incorporate UV directly into your primary light or as stand-alone supplemental lighting. The specialized lens material had enhanced features that will not only protect your lights, but also make your lights safe and reliable over time. Direct contact with light emitter eliminates photonic loss by eliminating the "gap"
Read more about Violet Gro in our blog: Future of Ag Lighting.